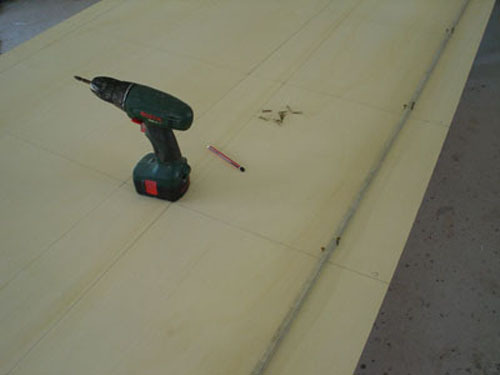 This boat will be built using Klegecell foam and polyester panels but the method is similar with plywood construction. 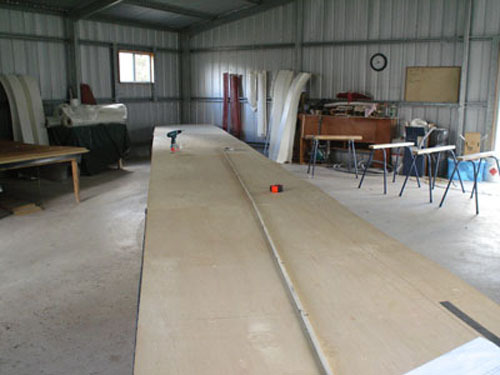 Our laminating shed is only 9m x 9m so setting up a surface to make panels (or scarf plywood panels) for a 32 foot boat is a little tricky. We set the tables across the shed diagonally and will carry the finished panels through a window to the other shed containing the building frame. 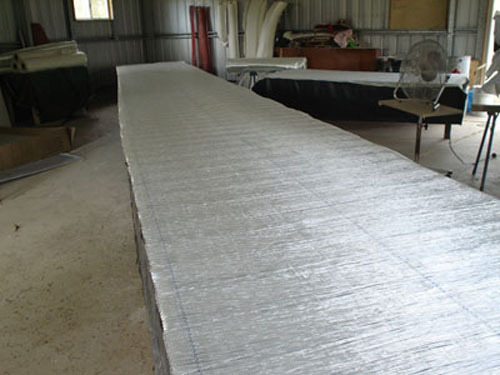 Four sheets of Klegecell where joined together using resin mixed with aerosil to make the 32 foot length (a four sheet boat). The sheets were held in place with drywall screws until the glue dried. 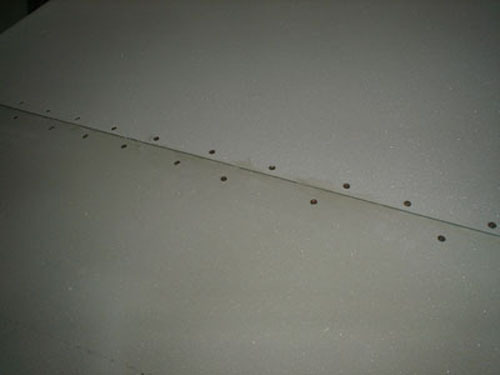 When the screws were removed the holes were filled with filler (Q cells mixed with resin). Glass was laid out on the foam and smoothed out. Peel ply was pre-cut in sections so it could be applied quickly to the panel. The resin was poured onto a section of foam and spread with a quality drywall tool ensuring complete wet out and covering only a small area Peel ply was then added quickly. After the first side had cured the whole panel was turned over and the glass added to that side. We now have a full length sheet glassed both sides. 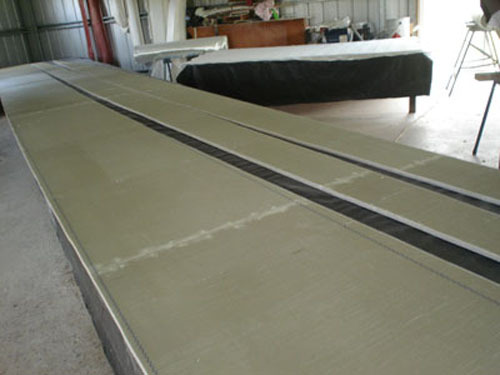 We have noted the amount of resin used per panel and the amount to cover the Klegecell foam and we are within 5% of the theoretical amount. We have found it is a quick way to make a full length panel that requires very little finishing without expensive pumps and consumables. It is not a quick as building with plywood but almost. We use Nuplex LSE (low styrene emmission waxed resin) and there is no detectable ordour so it will not offend the neighbours. > The panel shapes were lofted onto thin (3mm) low grade plywood. These shapes were then cut out to become templates. The shapes were drawn onto the foam panels and then cut out with a jig saw. You could draw the panels straight onto the laminated panels if desired.